I wanted Penguins. And Sunbirds. And Flamingos and Hornbills and a Secretarybird and birds with names like Hamerkop and Thick-knee and Eremomela (which I know is a scientific term, but which, when pronounced correctly, reminds me of a Yiddish term of endearment my grandmother used). And so, I went on the American Birding Association Safari to South Africa. It was the right time of year, October–spring in South Africa, the right price, and the right people—president of the American Birding Association Jeff Gordon, energetic emissaries George Armistead and Liz Gordon, and, very importantly, fellow 10,000 Birds beat writer Adam Riley and the staff of Rockjumper, who masterfully organized and guided the ABA Safari. One thing did bother me. If I’m going to sit on an airplane for 15-hours, I want a little more than 9 days birding. That was easily fixed by adding a post-Safari trip to Eastern South Africa, led by dashing Rockjumper guide Clayton Burne, to my itinerary. The small group was a good counterpart to the large, convivial ABA Safari group of 98 birders. 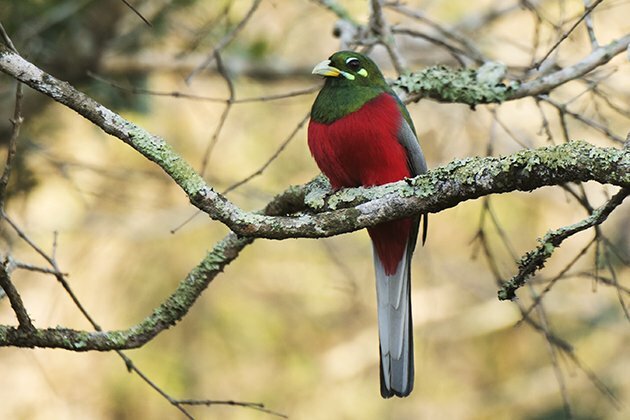 The trip itself gave me a chance to experience rural areas of South Africa, bird the tiny country of Lesotho, see a lot of larks and cisticolas (small brownish birds whose identification challenges make sparrow identification look simple), three turacos in one day, and this incredible Narina Trogon (which I had also seen on the Safari, but not half as clear or close). Both trips combined, I was away for 22 days, my longest birding trip ever. Wait, let’s backtrack a bit. Yes, there were 98 birders on the ABA Safari. That’s a lot, and the organizers of the safari did an excellent job of creating an environment that offered small group birding during the day and a birders party every night. There were birders from a wide cross-section of the United States: Colorado, Ohio, Idaho, Iowa, Wyoming, Washington State, Pennsylvania, New York State, New Jersey, California, Texas, Florida. I’m sure there are states that I missed, but you get the idea. Some birders told me they had no birding community in their home areas, which, for me, encapsulated the best reason behind the Safari (and other ABA big events)–the development of a national birding community. 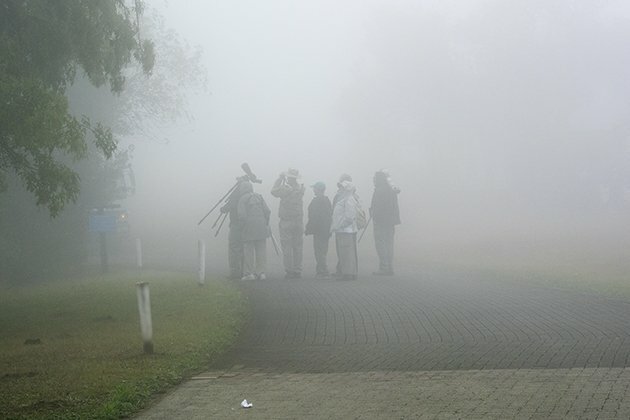 Birders in the early morning fog, Mt. Sheba. 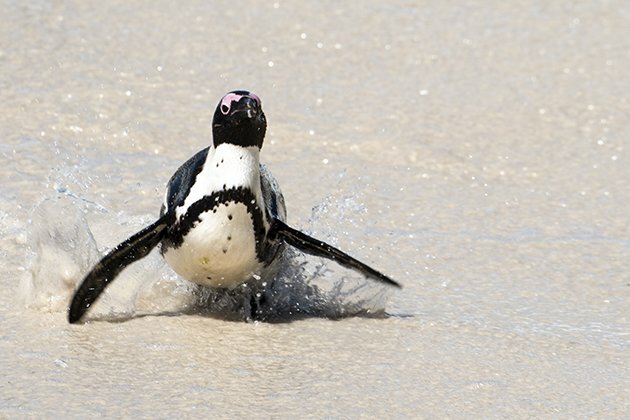 A second goal of the Safari was support of conservation; $100 of each registration fee went to Birdlife South Africa, a conservation organization affiliated with Birdlife International. I attended a talk by Mark Anderson, Birdlife South Africa’s CEO, on the organization’s successes, one of six optional evening presentations, and was impressed by the specificity and diversity of their projects. They range from the successful eradication of feral cats from Marion Island (hear that, Corey?) 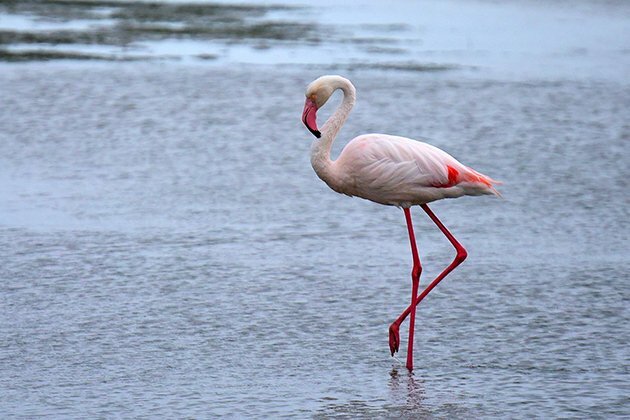 to the ongoing conservation of breeding Lesser Flamingos at Kimberley’s Kamfers Dam to the Albatross Task Force, which works with fishermen to find solutions to seabird bycatch (birds caught in fishermen’s nets). The Safari was focused on two locations: (1) Capetown, home of African Penguins at Boulders and Betty’s Bay and Ostriches at the Cape of Good Hope and Greater and Lesser Flamingos at West Coast National Park, and sunbirds and sugarbirds, (2) Kruger National Park, where we birders went gaga over Lions and Leopards and Giraffes, hornbills and storks, a blue lizard, and even, for a few lucky groups, a Secretarybird. (I was not on one of those lucky groups, but I did get to see a Secretarybird on my Eastern South Africa trip.) Jeff Gordon suggested in his introductory remarks on the first night of the Safari that we should focus on enjoying the birds, not amassing ticks. And so, in that spirit, I’ll spend the rest of this post talking about some of my favorite birds of the trip. I won’t count my life birds. Though I did get a lot. I think everybody did. But, we didn’t talk about that. A lot. I started my birding a day early, at Intaka Island, a refuge recommended by Redgannet, who kindly imparted some important points on birding South Africa before I left. 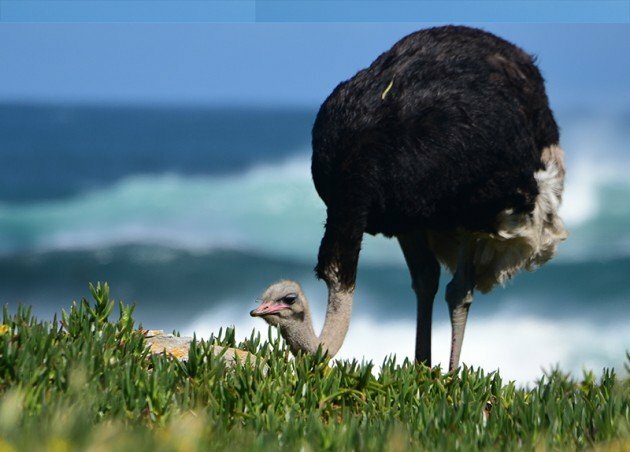 Hidden in a development called Century City northeast of Capetown, Intaka Island was a great introduction to the birds of South Africa. I didn’t always know what I was looking at, but I took notes and photographs. I did know the bird above immediately and rejoiced. Water Thick-knee! Also known as Water Dikkop. The bird was sitting quietly by a pool of water and probably would have totally escaped my eye if I hadn’t encountered a local photographer in a nearby hide (that’s South African/European bird speak for blind). 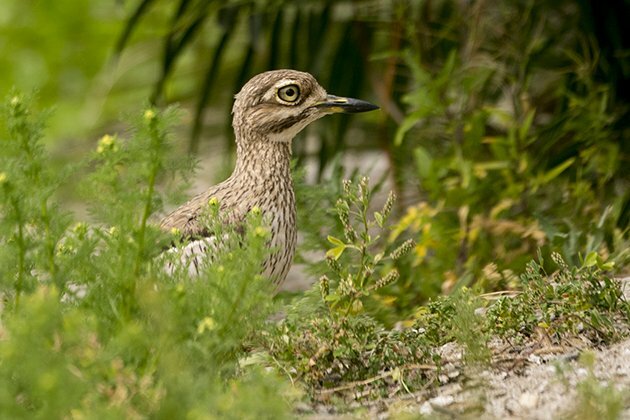 I got a double-header of thick-knees when I returned to our hotel at Milnerton Lagoon and found out that a Spotted Thick-knee could easily be seen in the yard of a nearby house. 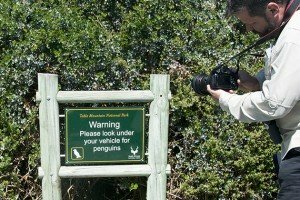 The African Penguins (formerly known as Jackass Penguins) were pretty much a “gotcha”, but I was still tremendously excited to see them on two field trips–the Boulders colony by False Bay and at the Stony Point colony at Betty’s Bay in the Western Cape. 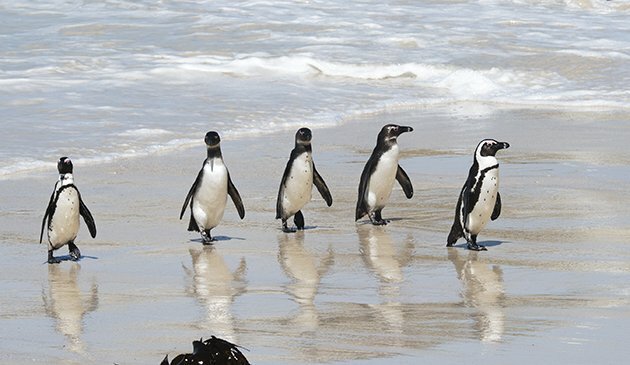 The penguins are well cared for by the South African powers that be–the national parks system and the Southern African National Foundation for the Conservation of Coastal Birds (SANCCOB), which rescues damaged penguins and other seabirds. 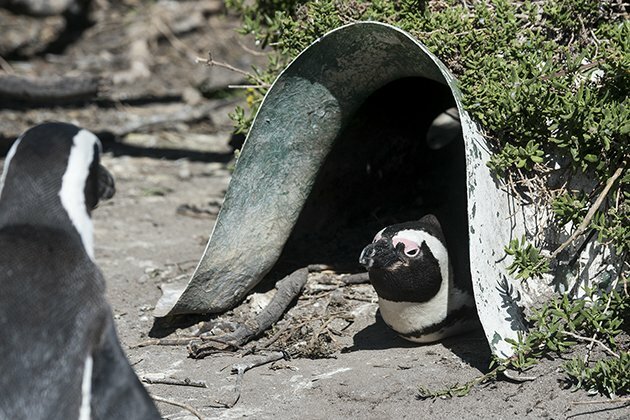 Fences and gates separate them from their adoring public, though word is that residents in the Boulders community are always not happy to find the penguins in their backyards in the early morning, and artificial burrows are provided for nesting, a substitute for the guano that they prefer to use but which is in short supply. Betty’s Bay was also a great place to see all of South Africa’s cormorant species, including the endangered Bank Cormorant. And then there were the Flamingos. I’ve been fascinated by flamingos since seeing them in the infield at Hialeah Park Race Track when I was a kid visiting Florida. I love watching them sieve the waters with those incredible bills. I knew I would see flamingos in South Africa; I wasn’t prepared for how many of them I would see and in so many places–Intaka Island, West Coast National Park, Strandfontein Water Works (aka the sewage ponds, because it wouldn’t be a birding trip without sewage ponds), and sometimes in the evening, flying overhead. We saw hundreds, maybe thousands, of Greater Flamingos, pale in the water, dramatically pink in flight. We observed far fewer Lesser Flamingos, a near-threatened species. How do you tell the difference? Well, there is size, obviously, and the bill. The Greater Flamingo is the bird with the pink bill tipped with black. And, then there were the bustards. Or korhaans. Bustard or korhaan, these large birds with small heads and long necks, were not always easy to view in the tall grass, and were always a prize sighting. There is some confusion with the common names for these birds. We were told that the smaller bustards had been renamed korhaans, but even the guides switched off between the two terms. 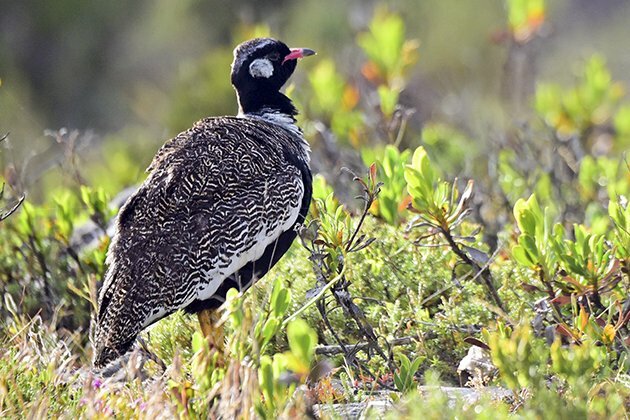 The first bustard/korhaan I saw was the endemic Southern Black Korhaan at West Cape NP (called Black Bustard in eBird). It was the first of six bustard species I would see over the course of both trips. A short plane ride took the ABA Safari birders Kruger National Park. Initially, I wasn’t that excited about seeing mammals. I am a birder, after all. But, the anticipation of everyone else in the group was contagious, and when California birder Lori Conrad looked out the window of the plane as we started our descent and screamed, “Elephants! There are elephants down there!” I burst into applause with the rest of the plane. Adam told us about the Big Five (and scolded me for not reading his post about them), and I think there were few birders in the group who did not finish the trip with all five on their lists. 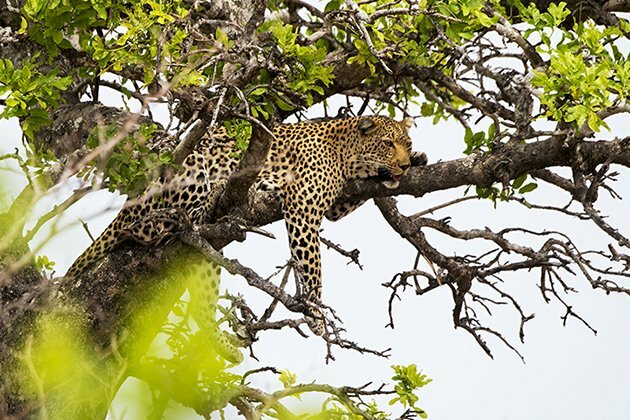 My group watched this leopard walking parallel to the road, then back into the grass, and then–whooop–up a tree, where he relaxed while being watched by people in at least twenty vehicles. 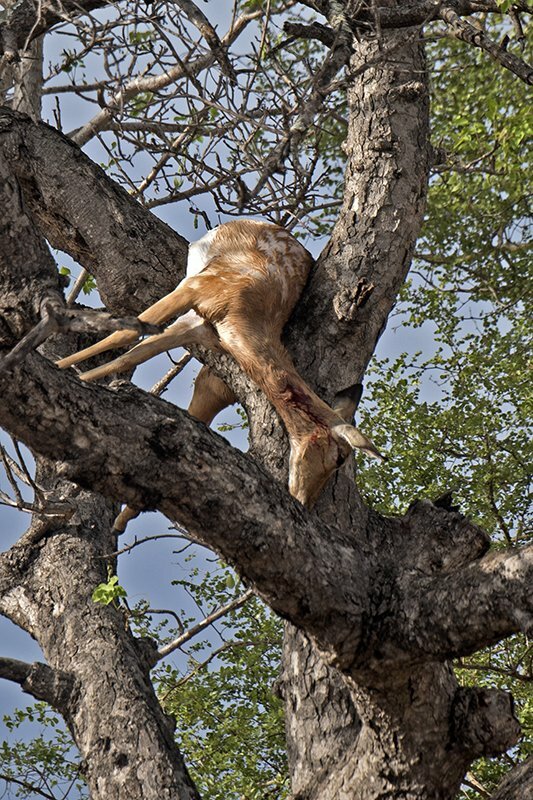 The leopards place their kill in a tree, protecting it from poaching by other predators. So, the best way to find a leopard is to find the kill. As we were leaving Kruger early one morning, we spotted two cars parked next to this scene. It was a fresh kill, and though it might take hours, the observers knew that eventually the leopard was going to come back for his breakfast. Or lunch. Sadly, we weren’t able to join them or the leopard. The Big Five–lion, leopard, African buffalo, elephant, and rhinoceros–are impressive, but my heart lies with the patterned mammals, giraffes and zebras. 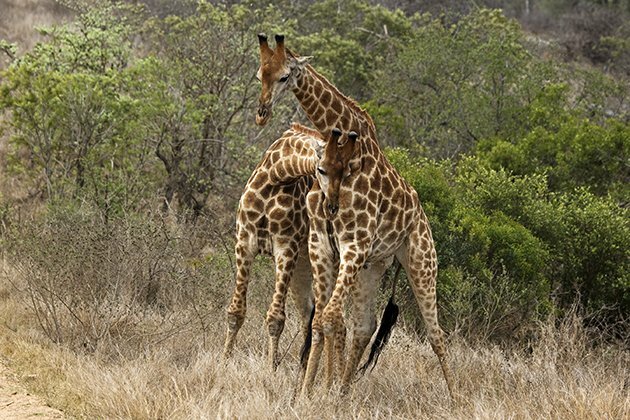 I was ecstatic when we found two giraffes by the side of the road “necking”, which I found out is a male test of strength and dominance, not a romantic entanglement. I was a bit disappointed that I did not see many butterflies or dragonflies in South Africa. I was told it was too early, which makes sense when you consider that it was early spring. I did admire the herps we came across in our travels. 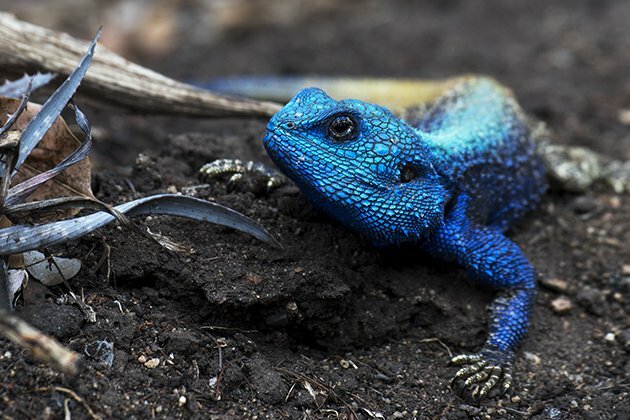 This Blue-headed Tree Agama, which was seen in a number of locales throughout Kruger. This one was in the parking lot of the Satara Rest Camp, where we stopped for lunch on the Northern Satara field trip. 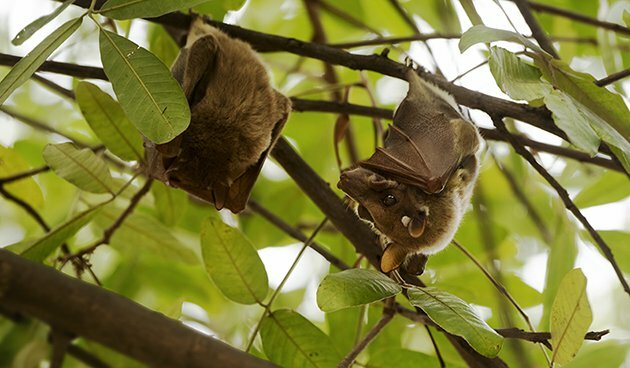 We also got great views of a very small mammal, Wahlberg’s Epauletted Fruit Bat, at Satara. 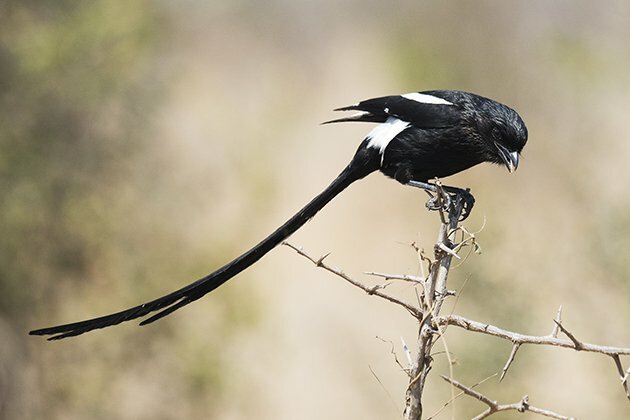 South Africa is full of birds with long tails, from the tiny Pin-tailed Whydah to the sugarbirds to the widowbirds. My favorite was the Magpie Shrike, and this particular bird gave us quite a show as he showed off his tail to us. This immature Verreaux’s Eagle-owl was one of the first birds I saw at Kruger, on the introductory afternoon ride through the park. This is a big young ‘un! 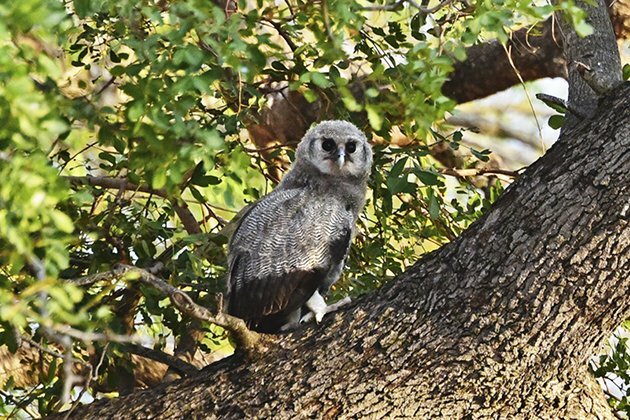 Verreaux’s Eagle-Owls are amongst the heaviest and longest owls in the world. He was climbing the tree trunk under the watchful eye of mother and father, both ensconced in leaves and branches above, but, though he occasionally stretched out his wings, did not seem ready to fly. And, then there were the weavers. 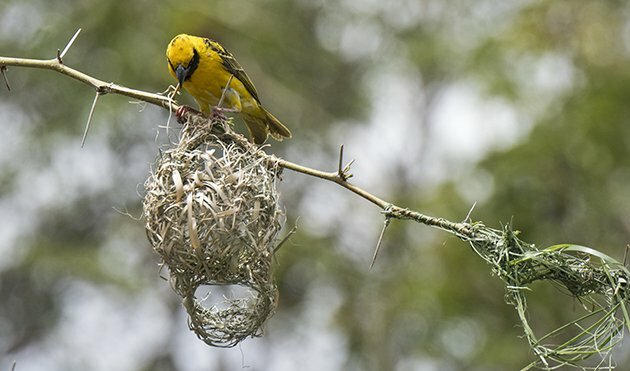 Wherever I went in South Africa, from Intaka Island to Kruger NP to eastern towns and gas stations, there were weavers, busily making weaver nests in their large weaver communities. They were an identification challenge. Originally, in Capetown, we saw Cape Weavers and Southern Masked-Weavers, which were pretty easy to differentiate. One had a masked and one did not. But, then we saw Lesser Masked-Weavers and Thick-billed Weavers and Spectacled Weavers and Village Weavers, altogether 10 species of weavers, and identification became a lot harder. This weaver was seen on my Eastern South Africa trip, in the parking lot of a small shopping center. It is, I believe, a Southern Masked Weaver. It was a joy watching it at work, flying back and forth with material, carefully creating an architecturally perfect home, oblivious to the traffic and curious birders surrounding it. It’s hard to bring this post to a conclusion; I have so many more photos and birds and mammals to talk about. And people–I met great, knowledgeable, fun people on both trips–birders and guides and ABA and Rockjumper staff–many of which I hope to bird with again. There is talk that ABA will be doing another great excursion. I’m looking forward to more adventures in international birding and conservation. Some book notes before I sign off, because this is supposed to be the book beat post. I discovered in the middle of the trip that the field guide I brought with me, Birds of Southern Africa, 4th edition, by Ian Sinclair, Phil Hockey, Warwick Tarboton, and Peter Ryan. published by Princeton University Press in 2011 is actually the same book as the Sasol Birds of Southern Africa, 4th edition, published by Struik Nature. I felt a little silly that I didn’t realize this before, my excuse being that the covers are completely different and that you have to read the PUP preface carefully to see any reference to the European edition.This meant that the app I had downloaded to my phone, Sasol eBirds of Southern Africa, produced by mydigitalearth.com, was the same as the book I had brought, which was not my intent.The app itself was excellent–easy to use, comprehensive, and relieving me of the burden of carrying a heavy book in my backpack. Safari participants also used two other field guides: Robert’s Bird Guide by Hugh Chittendon (John Voelcker Bird Book Fund, 2007) and Newman’s Birds of South Africa by Kenneth Newman and Vanessa Newman, commemorative 10th ed. (Struik, 2011). Sasol and Robert’s are the two field guides recommended by Rockjumper. Newman’s also has a mobile app available, which one Safari birder was using, and it appeared to be as convenient and usable as the Sasol app. Yeah, I’m pretty excited to be going there in 5 weeks. Got a pretty amazing trip planned, although weirdly Kruger isn’t on the list. I am taking Adam’s advice and visiting Wakkerstroom though. I am hoping to pick up leopards, I always miss those guys! As for guidebooks, I’m thinking of getting by with my 2000 verion of the Sasol and the phone app for newer splits. I like that the app allows you to use location to narrow down the likely species. How annoying, I have quite a few bird guides for Africa and due to all those new splits, they are almost obsolete now! Wakkerstroom was a pretty cool place. You have the marsh and the water birds and the fields with the larks and pipits. It was cold and windy when we were there, though I imagine in 5 weeks it will warm up a bit. I liked the village a lot. The square featured a sign of village events, headed by the bird club meeting. Looking forward to hearing about your travels, Duncan. I really enjoyed this post as I’m not long back from Kenya where we saw some of the same birds and animals, so shared your excitement about it all. It sounds like a great experience and thanks for sharing it. Wonderful trip summary Donna! Wish I could have been there to bird with you. Thanks for taking such wonderful photos! Also, that lizard is awesome. I bet Kenya was pretty cool too, Sonja. I wonder how much the birds overlap. Frances, I wish you were there too. Next safari! Hi Donna – thanks for a superb summary of the ABA South African safari – I am thrilled to hear that you had such a great time, it was fun meeting and birding with you! Well done on the superb images too! Birds are looking so beautiful. I am so excited about looking this natural beauty of the South Africa birding safari. Yes! Bird-watching always seems like the forgotten stepchild in safari culture. It’s all about the Big 5. Psshh. Great pictures. Really shows the diverse beauty of the various birds and wildlife you can find on African safari. 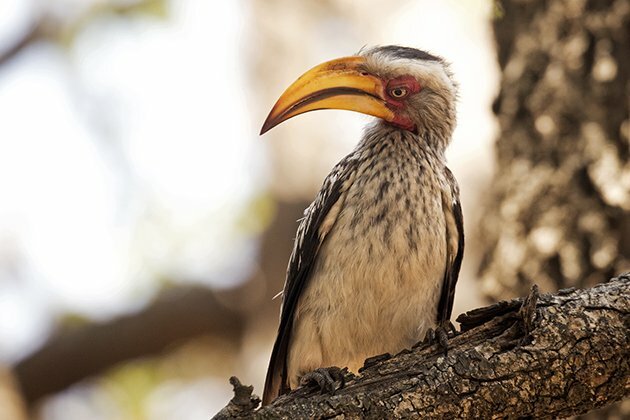 I saw a couple of different amazing birds on my three-week Botswana safari (hhttps://www.rothschildsafaris.com/safaris/botswana/highlights-southern-eastern-africa/).